Texterity, a publisher of digital magazines in the US has announced that it already has 52 digital magazines available for the iPhone and the iPod Touch. 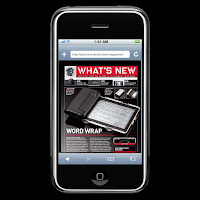 The company introduced the Release 1.0 version which will allow iPhone and iPod Touch users to have easier access to their digital magazines through a single browser window as well as a full search capability, links to websites, table of contents, and a hot link to easily subscribe to the featured magazines. Some of the publishers included in the Release 1.0 includes Readers Digest, Time Inc., O'Reilly Media, EH Publishing, and a whole lot more.